A single programming language is no longer enough. I predict that soon, the best programmers will fluently move between languages and the best languages will interoperate well with others. This interoperability will likely stem from strong metaprogramming facilities. I examine how we might build a programmable compiler and look at recent work toward that end. Figure 1: the programming languages of the world are fragmented. What if we all spoke the same one? Figure 2: copying code with the C preprocessor. This is not a safe way to do macros! C preprocessor macros are functions from String → String that take in raw uninterpreted source code and produce more raw source code. This is an unwieldy form of compilation as the macro writer can infer nothing about the structure of his inputs, but it is compilation nonetheless. C macros define new syntax that can change the language in nontrivial ways (see Cello or Boost). The C language itself can also be considered metaprogramming if you treat it like a giant macro language for assembly. The most productive programmers in the coming years will be those that can work between multiple interoperable languages instead of a single general purpose language. The most productive programming languages will be those which are fully extensible at the language level. This kind of diaspora is symptomatic of a larger trend occurring across both industry and academia. In data science, rather than coding math routines by hand in FORTRAN/C/CUDA, statisticians write correlations in Python and then call out to C to do the heavy lifting through libraries like numpy. In software engineering, languages like Groovy are used to reduce the verbosity of project configurations in Java and encode high level business logic. Domain-specific languages (DSLs), or programming languages specialized to a single purpose like physical simulation or graphics shading, emerge from the woodwork at an unprecedented rate. Compilers are hard. To define a language today, you need to know lexing and parsing/context free grammars as well as tools to generate lexers and parsers. You need to understand abstract syntax trees, type systems (including inference), intermediate representations (e.g. LLVM), assembly languages (x86, WebAssembly, …), optimizations, interpreters, JIT compilers, and so on. Courses on compilers have high variance in quality, so only a small number of developers end up qualified to work on industrial-strength compilers. By contrast, every language has a million tutorials teaching its ins and outs, so writing a library is far easier than writing a language. Interoperability is hard. Unless a new language has such exceptional merit so as to stand on its own, it must be able to work with some existing set of languages. Working well with another language requires either pinning to their runtime/type system (e.g. Scala/Clojure running on the JVM) or defining a foreign function interface for moving between the two (e.g. every language that can call to C). So many new languages wither away because they don’t play well with the existing ecosystem of programming tools. Today, neither of these problems are close to being solved. However, solutions are on the horizon, and I believe these are what will usher in the era of the metaprogrammer. Languages today generally lack interoperability because they are developed each in isolation. The people writing GHC for Haskell aren’t thinking, “how can we optimize for Python compatibility?” So glue between languages ends up with ad-hoc bindings that are rarely cross-platform. Specifically, by “develop in isolation,” I really mean that all of these languages either LLVM/x86 or a custom-made bytecode (that in turn is interpreted by code compiled by a language targeting LLVM/x86). 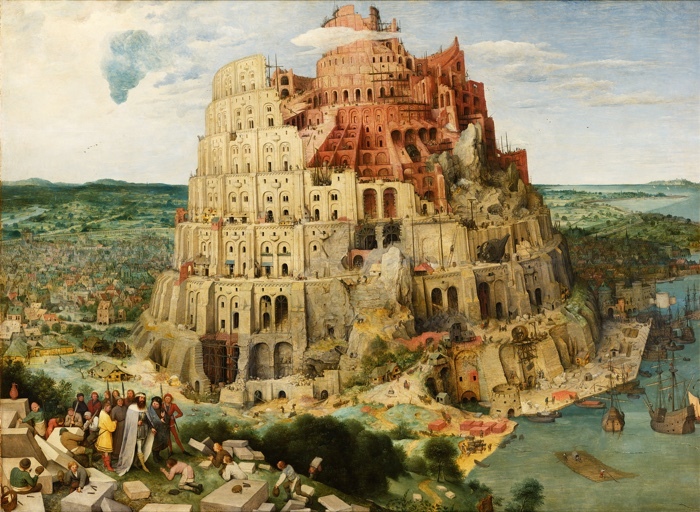 Interop between languages needs to happen at a level far higher than abstract assembly to get any meaningful benefit. Ideally, languages would be developed as extensions to a base language that was more high level than assembly, one like Rust or OCaml. In order for languages to be created as such, these base languages need strong facilities for metaprogramming. I’ve heard it said that the last forty years of programming language development have been rediscovering all the features of Lisp, and that metaprogramming is the last part that has yet to make it into the mainstream. Lisp is famous for its declaration that “code is data,” and so should it be. However, Lisp takes the easy way out to turning code into data by forcing programmers to code in blobs of parentheses, or S-expressions. Of course metaprogramming is easy when the programmer writes in the closest possible thing to abstract syntax. The more interesting question is: how does metaprogramming, this second order automation, work with different syntaxes? Different intermediate representations? Languages with garbage collection and languages with dynamic types? The answer to this question will come in the form of a programmable compiler. For too long, the compiler has been treated as an almost sacred boundary, its APIs off limits to the programmer except for some set of restricted AST transformations. I believe that a fully programmable compiler, one which exposes its concrete syntax, abstract syntax, and code generation facilities to its users, can solve both of the issues limiting language development. To understand how, let’s take a look at some recent work in this area. 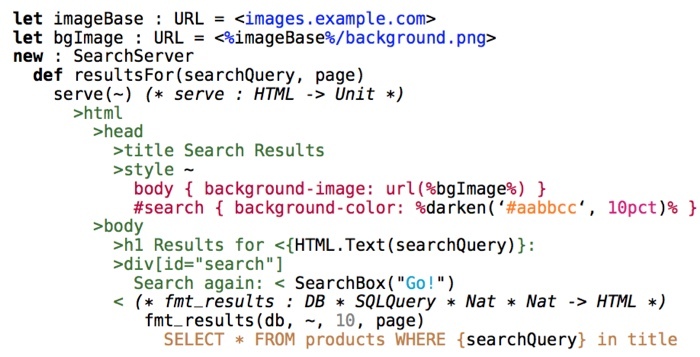 Figure 3: HTML templating with SQL and CSS mixed in using Wyvern. 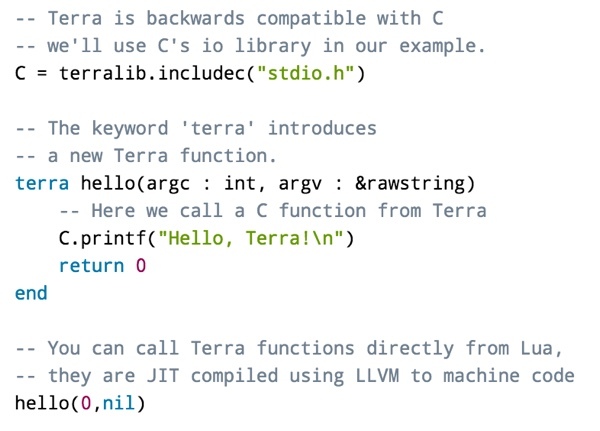 Terra: at Stanford, Zach DeVito along with Pat Hanrahan created the Terra language, which is a low-level language that is interoperable with Lua and can also be metaprogrammed in Lua. Their primary goal for Terra is using it to construct domain-specific languages like Ebb and Opt. While Wyvern compiles down its languages all into the same base language and type system (SML), Terra uses Lua to define both the compiler and the top-level interface for each new language, but then compiles them down into Terra (as opposed to Lua) for performance. Figure 4: JIT compiling Terra code in Lua. Here, the fundamental concept is that exposing the compiler’s intermediate representations enables other languages to precisely control their compiled code (as oppose to just compiling to the host language and hoping for the best) while still maintaining a level of interoperability. // lia! declares a set of Lia functions. It is a procedural macro that compiles Lia into Rust. // do the appropriate type-casting from Lia's dynamic types into Rust's static types. // Lia includes macros that simplify handling Lia functions and values in Rust. Figure 5: Using Rust code in Lia to multiply matrices. There’s considerably more related work in areas like gradual/like typing, metacompilation, and so on than can be discussed in this note. There’s also plenty of related work that I’m simply unaware of—make sure to bring it up in the comments! This note is more for inspiring discussion than providing answers, as I don’t yet know what the fabled programmable compiler will look like or how it will work. My vague idea is to create a second-tier language in a similar fashion to Lia, so a language like OCaml embedded in Rust, and then to use that as a starting point for metaprogramming that can produce TSLs (in Wyvern style) that compile to OCaml or produce DSLs (in Terra style) that compile to Rust. If you have any ideas, please let me know either in the comments or at wcrichto@stanford.edu.